BBC Sport pundit Garth Crooks has selected his Premier League team of the week, and it’s dominated by Liverpool and Man City this time round. The Premier League title rivals were both in action on Sunday and both picked up wins as the fascinating and enthralling title race continues this season. With several standout performances in their respective victories over Chelsea and Crystal Palace, it’s no real surprise then that Crooks has selected several of their players, as noted in his BBC Sport column. Mohamed Salah gets the nod in an attacking trident after his sensational goal wrapped up the win at Anfield, with the Reds talisman providing a moment of magic when his side needed it. He’s joined by Raheem Sterling who scored twice at Selhurst Park to continue his impressive campaign, as the two stars continue to fire their respective teams closer to title glory. Lucas Moura breaks up the monopoly after scoring a wonderful hat-trick for Tottenham in their big win over Huddersfield, as the Brazilian stepped up and delivered with the likes of Harry Kane and Dele Alli out injured. Kevin de Bruyne makes the cut in midfield after bagging two excellent assists for City, while Jordan Henderson also provided one for Liverpool teammate Sadio Mane as both were instrumental throughout the 90 minutes in winning the midfield battle for their sides. Nathan Redmond and Paul Pogba were also both on target over the weekend and they complete the midfield, while Nathan Ake gets the nod in defence after starring for Bournemouth in their 5-0 win at Brighton. Virgil van Dijk unsurprisingly gets selected after another important display at the back for Liverpool, and he’s joined by Vincent Kompany who was handed a rare start and gave City a strong platform to build on. The XI is completed by Reds goalkeeper Alisson who was kept busy against Chelsea and produced some crucial saves to protect their lead, with Eden Hazard undoubtedly feeling as though he could have done better. 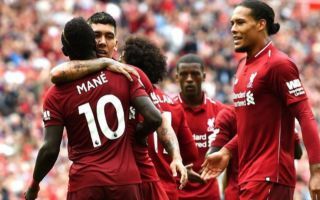 Nevertheless, it was another important contribution from the Liverpool backline as they continue to go toe-to-toe with Man City in the battle for the title. As for Crooks, it’s difficult to disagree with the majority of his picks as they were all influential in big results for their sides, although as noted in the tweets below, there were several fans who disagreed with his selections. Bournemouth will arguably feel aggrieved not to have more players involved aside from Ake after several standout performances, while Pogba didn’t particularly impress. That would suggest his two penalties were the main reason for inclusion, which seems a little lazy in truth. Full XI: Alisson; Ake, Kompany, Van Dijk; Henderson, Pogba, De Bruyne, Redmond; Sterling, Salah, Lucas. This guy doesn’t watch the games, just looks at the results and watched MOTD. Pogba was completely ineffective other than scoring two penalties and yet gets in his team of the week. Guy has no clue. We win 5-0 away. Wilson 1 goal and 2 assists. Fraser 1 goal and 2 assists. Neither in the team. The bloke is an absolute joke.